We are sorry but your browser is outdated and cannot display our website as it is meant to be. For a better web experience, we highly recommend you to update your version of Internet Explorer, or to install another web browser, more respectful of the web standards. However, if you still want to visit our site with your current browser, you can close this window by clicking here, but you are very likely to experience some serious navigation issues. Niestety strona jest dostępna tylko po angielsku lub francusku. For the sake of viewer convenience, the content is shown below in this site default language. You may click one of the links to switch the site language to another available language. Using the right tool ena bles to take full advantage of your machine capabilities, that is the reason why we develop our own milling tools. 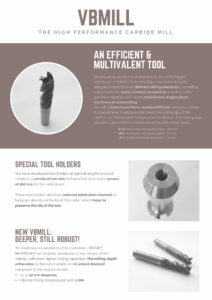 Our mills fit all types of machining and have outstanding performance. Our milling cutter meets the needs of metal construction as well as other precions industries such as the manufacture of agricultural machinery or locksmithing. 4 times faster than a standard HSS cutter, our mill executes operations in a record time. In addition to its speed, the cutting tips of VBMILL are chamfered to further extend its lifetime. The coating also provides a plus in terms of chip evacuation and cutting speed. For more information, please click on the image. Niestety strona jest dostępna tylko po angielsku lub francusku.